Старший научный сотрудник отдела физики сверхпроводников (отд. 120), к. ф.-м. н. 2004 — защитил кандидатскую диссертацию «Особенности структуры смешанного состояния в тонких сверхпроводящих пленках». A.Yu. Aladyshkin, A. V. Silhanek, W. Gillijns, and V. V. Moshchalkov, «Nucleation of superconductivity and vortex matter in superconductor-ferromagnet hybrids» // Superconductor Science and Technology, vol. 22, 053001 (2009); selected for Superconductor Science & Technology’s Highlights of 2009 Collection; e-print arXiv: cond-mat/0902.1630 (2009). А.Ю. Аладышкин, А. К. Воробьев, П. П. Вышеславцев, Е. Б. Клюенков, А. С. Мельников, Ю. Н. Ноздрин, И. Д. Токман, «Структура смешанного состояния, индуцированного в тонкой YВaCuO пленке полем малой ферромагнитной частицы» // ЖЭТФ, т. 116, выпуск 5, с. 1735−1749 (1999). A.Yu. Aladyshkin, A. S. Mel’nikov, I. 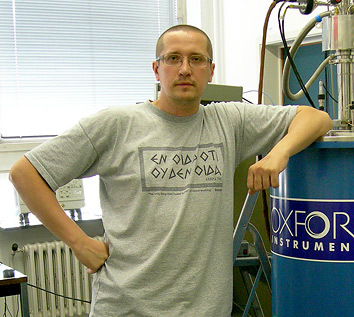 A. Shereshevsky, I. D. Tokman, «What is the best gate for vortex entry into type-II superconductor? "// Physica C 361, p. 67−72 (2001); e-print arXiv: cond-mat/9911430 (1999). A.Yu. Aladyshkin, A. S. Mel’nikov, D. A. Ryzhov, «Little-Parks effect and multiquanta vortices in a hybrid superconductor-ferromagnet system» // Journal of Physics: Condensed Matter, vol. 15, p. 6591 — 6597 (2003), e-print arXiv: cond-mat/0302551 (2003). W. Gillijns, A. Yu. Aladyshkin, M. Lange, M. J. Van Bael, V. V. Moshchalkov, «Domain-wall guided nu-cleation of superconductivity in hybrid ferromagnet-superconductor-ferromagnet layered structures» // Physical Review Letters, vol. 95, 227003 (2005). A.Yu. Aladyshkin and V. V. Moshchalkov, «Thin-film superconductor-ferromagnet hybrids: Competition between nucleation of superconductivity at domain walls and centers of the domains» // Physical Review B, vol. 74, 064503 (2006. A.Yu. Aladyshkin, D. A. Ryzhov, A. V. Samokhvalov, D. A. Savinov, A. S. Mel’nikov, V. V. Moshchalkov, «Localized superconductivity and Little-Parks effect in superconductor — ferromagnet hybrids» // Physical Review B, vol. 75, 184519 (2007). W. Gillijns, A. Yu. Aladyshkin, A. V. Silhanek, and V. V. Moshchalkov, «Magnetic confinement of the superconducting condensate in superconductor-ferromagnet hybrid composites» // Physical Review B, vol. 76, 060503® (2007); e-print arXiv: cond-mat/0706.3803 (2007). N. Schildermans, A. Yu. Aladyshkin, A. V. Silhanek, J. van de Vondel, and V. V. Moshchalkov, «Different regimes of nucleation of superconductivity in mesoscopic superconductor/ferromagnet hybrids» // Physical Review B, vol. 77, 214519 (2008). A.Yu. Aladyshkin, J. Van de Vondel, C. C. de Souza Silva, and V. V. Moshchalkov, «Tunable anisotropic nonlinearity in superconductors with asymmetric antidot array» // Applied Physics Letters, vol. 93, 082501 (2008); e-print arXiv: cond-mat/0904.1605 (2009). A.Yu. Aladyshkin, J. Fritzsche, and V. V. Moshchalkov, «Planar superconductor/ferromagnet hybrids: Anisotropy of resistivity induced by magnetic templates» // Applied Physics Letters, vol. 94, 222503 (2009); e-print arXiv: cond-mat/0905.2590 (2009). A.Yu. Aladyshkin, D. Yu. Vodolazov, J. Fritzsche, R. B.G. Kramer, V. V. Moshchalkov, «Reverse-domain superconductivity in superconductor-ferromagnet hybrids: effect of a vortex-free channel on symmetry of I-V characteristics» // Applied Physics Letters, vol. 97, 052501 (2010); e-print arXiv: cond-mat/1005.1246 (2010). A.Yu. Aladyshkin, A. P. Volodin and V. V. Moshchalkov, «Effect of ferromagnetic film thickness on magnetoresistance of thin-film superconductor-ferromagnet hybrids» // Journal of Applied Physics, vol. 108, 033911 (2010); e-print arXiv: cond-mat/1007.2527 (2010). A.Yu. Aladyshkin, G. W. Ataklti, W. Gillijns, I. M. Nefedov, I. A. Shereshevsky, A. V. Silhanek, J. Van de Vondel, M. Kemmler, R. Kleiner, D. Koelle, and V. V. Moshchalkov, «Mesoscopic cross-film cryotrons: Vortex trapping and dc-Josephson-like oscillations of the critical current» // Physical Review B, vol. 83, 144509 (2011); e-print arXiv: cond-mat/1102.4545 (2011). R. Werner, A. Yu. Aladyshkin, S. Guénon, J. Fritzsche, I. M. Nefedov, V. V. Moshchalkov, R. Kleiner, and D. Koelle, «Domain-wall and reverse-domain superconducting states of a Pb thin-film bridge on a ferromagnetic BaFe12O19 single crystal «// Phys. Rev. B, in press (2011); e-print arXiv: cond-mat/1105. 6048 (2011).